The Kenmore 116 vacuum cleaner series consists of a wheeled canister, a flexible plastic suction hose and a rigid Power-Mate wand. 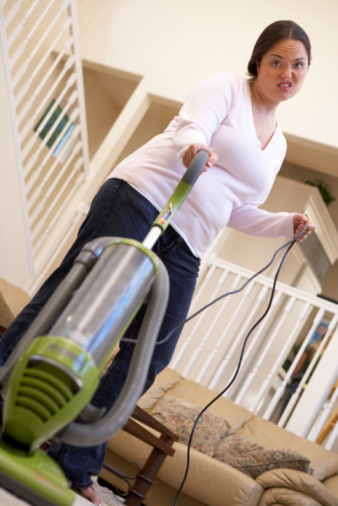 You might want to take your vacuum apart before placing it in long-term storage or if you plan on selling the appliance. There are several removable parts that make up the vacuum cleaner. Breaking them apart reduces the size of the appliance, making it easier to package, store or ship. Press each release button, working from the handle down to the base of the wand. Twist and pull apart the sections. The wand breaks into three pieces, including the foot plate that moves along the floor. Gather the sections and set them aside. Pinch the latch on the plastic socket where the hose meets the canister of the vacuum cleaner. Pull the plastic hose out of the canister and roll it up. Tie up the rolled hose, if necessary, with string to prevent it unravelling in storage. Press down on the latch built into the handle of the canister, near the top. Open the canister's hood cover and slide out the vacuum bag stored inside. Discard the bag and close the lid until it latches shut. Gather the pieces of the vacuum cleaner, which is ready for storage or shipping. Hold down the cord storage button, if necessary, to automatically wind up the electrical cord.